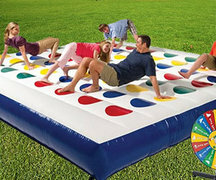 Experience the timeless family game on a large scale with this interactive Inflatable Twister Game. Perfect for summer parties, birthday bashes, graduations, or any other event you could possible imagine, this inflatable makes a great addition to any bouncy house rental business. A color spinner is included for ease of operatation. The Inflatable Twister can be set-up indoors or outdoors.